Few people look forward to spending time in a hospital waiting room. There is typically bright, fluorescent lighting, a selection of sterile furniture and, if you’re lucky, a smattering of old magazines to thumb through while you wait for your turn. Penn Medicine wants to turn that experience on its head by transporting patients to an alternate world. With the Radiation Oncology Department’s new virtual reality program, patients can spend their waiting time looking at the sunrise from the edge of a dock instead of staring at an empty wall. 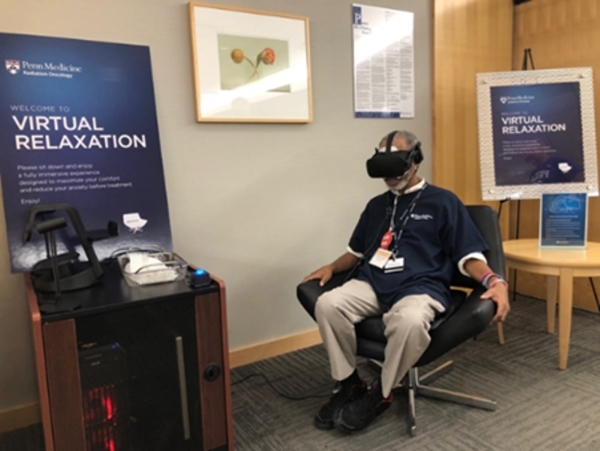 The department’s new VR mindfulness program is currently being hosted in the Roberts Proton Therapy waiting room at the Perelman Center located at 3400 Civic Center Blvd. The eight-minute voice-guided meditation experience provides patients an alternative to reading a magazine or watching TV while they wait for treatment. The immersive audio-visual scene gives them the opportunity to relax as they lose themselves in a serene environment of a virtual lake. “It allows you to refocus yourself. We all have stresses, and cancer patients have a lot of stresses. It allows some of those [stresses], for just a little bit, to slide away,” Chair of Radiation Oncology at Penn Medicine James Metz said. Since its launch in August, the program has expanded to provide more VR headsets and private cubicles where patients and their loved ones can enjoy the VR experience without distractions. The personal experiences of William P. Levin, clinical associate professor of radiation oncology, inspired this integration of mindfulness with patient care. He said that his own practice of mindfulness meditation has taught him to control his breathing to reduce his stress, adding that he believes this can help patients through stressful periods in their lives. Patients have responded well to the program so far. “They’ve said that ‘it takes me out of the medical environment and puts me in a place of happiness. I was at peace’,” the department of radiation oncology’s director of patient engagement and business development Fern Nibauer-Cohen said. The opportunity to relieve stress has expanded beyond those in the waiting room, too. To decrease physician burnout, a VR station was added to the clinic for physicians and other staff to relax and recharge. The technology has also been used to guide patients through the facilities at the Radiation Oncology department. The department made a virtual tour of the department in collaboration with one of their own cancer patients, who is also a filmmaker. Using their phone and a Google Cardboard sent to them through the mail, patients can take the 360-degree tour, which is set to launch by the end of the month. They can even see an animation of how radiation therapy destroys cancer cells. The mindfulness program has more plans to expand within the next year. New VR programs will be added so patients can choose different environments to immerse themselves in. There are plans to bring the program to various Penn Medicine satellite health centers and make the VR experience more interactive. But Levin said that the VR mindfulness program has the potential to be more than just an avenue for patients to reduce their anxiety in the waiting room.